Our Food Security Journalism Award is part of The Crawford Fund’s commitment to encourage working Australian journalists to investigate the important roles that agricultural research, training and rural development play in global food security. The prize is a ‘seeing is believing‘ visit to a developing country. Now in its sixth year, we have supported radio, print and TV journalists with visits to India, Timor Leste, Colombia and Nepal. 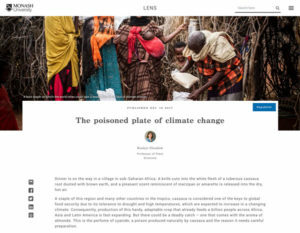 This year, Clarisa Collis, Assistant Editor of GroundCover, Coretext took home the top prize for her story “The poisoned plate of climate change”. Clarisa’s award was announced by The Hon John Anderson, Chair of the Crawford Fund at the annual conference dinner on 13 August. The “Reshaping Agriculture for Better Nutrition: The Agriculture, Food, Nutrition, Health Nexus” conference was held at Parliament House in Canberra (13-14 August). “I think the standard is even higher this year than in the past, which made it more difficult than my previous years on the judging panel to choose a winner,” said Jenni Metcalfe, who has been the nominee of the Australian Council of Agricultural Journalists since the award commenced in 2013. This year’s judging panel included the Crawford Fund’s Cathy Reade, Jenni Metcalfe from Econnect Communication, as the nominee of the Australian Council for Agricultural Journalists, and Dr Daniel Walker, Chief Scientist from the Australian Centre for International Agricultural Research (ACIAR) as the agricultural science member. “This has been a great year for our journalism award – both with the number of entries and their quality. Many thanks to all those who entered. It is great to see a growing interest in food security issues,” remarked Cathy.